Now that we’re finally into spring and embracing the fresh start the season brings, I thought I’d give my financial situation a bit of spring cleaning. With house projects (which are all more expensive than you think they should be), savings goals, and travel dreams, I’ve got to button down on the sartorial front and keep myself to a more reasonable amount. I’m going to start with $200 per month, and put $50 per paycheck into a “splurge” savings account for whatever captures my fancy down the road. (That, along with blog revenue, is how I saved for my Gucci bag.) I feel like I’m in a really good spot with the foundation pieces in my wardrobe, so $200 should be plenty of money to freshen up my collection and add a few nicer pieces over the months. See all of this year’s sartorial additions here. Old Navy bow-topped slides in gingham ($15) – Aren’t these adorable?! They fit true to size. New Look ruffle strappy jumpsuit ($32; worn here) – With black slides and statement jewelry, this jumpsuit is perfect for warmer days. I went up a size because I liked the looser fit. 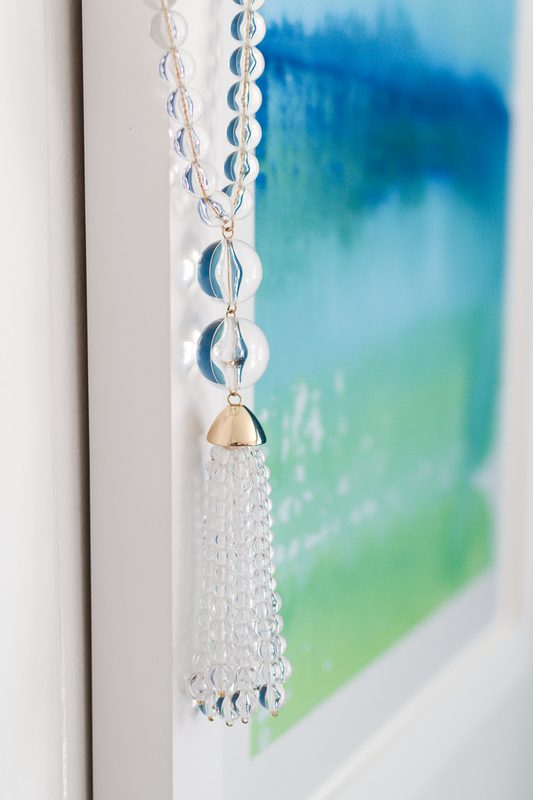 Anthropologie Lucite tassel necklace ($68; pictured above) – We stopped at Anthropologie while we were waiting for our dinner reservations in London, and I fell in love with an oversize Lucite beaded necklace with a tassel pendant. I almost didn’t purchase it since I hate buying things overseas that I can get here, but I couldn’t bear the idea of not having it in my collection. As it turns out, it’s a good thing I bought it because it’s not on Anthro’s website. London street vendor earrings and ring ($21) – I bought an oversize silver and lapis ring at Brick Lane Market and a pair of circular brass earrings at Old Spitalfields Market that will probably irritate my ears, but they were super cute and cheap. Things I tried and didn’t love. Gap mid-rise skinny jeans in black – I own the blue version of these jeans, but for some reason the black pair ran exceptionally small. I couldn’t get them over my hips. J.O.A. striped mini dress – I wanted to love this dress and even tried it in three different sizes to see if it could work. The medium was way too small, despite the claim that a medium fits a size 8. I tried the large and couldn’t breath with it zipped up. And I even tried the XL, which was too large in bust and waist. Sigh. It’s super cute, though! This month was all about checking things off of my long-term wish list and filling gaps in my wardrobe. This made it an expensive month, but I feel really good about where things are at and it’s nice to have these essential pieces taken care, even if it makes this year’s wardrobe additions seem awfully boring when viewed together. Many of these purchases were in preparation for London. I needed a few foundation items (like jeans in a smaller size and loafers) to mix and match on our trip. I’m trying to pare down my suitcase substantially this time around. I tend to rewear items on trips, so I’m just going to embrace it. (I’ll share my packing list this week.) Granted, not as fully as I did in Copenhagen a couple of years ago when I didn’t realize it would be as cold as it was and I wore the same sweater and jeans every day! I’m sure I’ll do enough damage to my bank account on our trip, but I’m primarily hoping to pick up housewares as souvenirs instead of clothes. (I say this knowing that I won’t be able to resist bringing home a piece of jewelry to commemorate our first visit to the U.K.) Once we’re back, I’ll take a look over my spring and summer wardrobe and see what kind of holes need to be filled or trends I’d like to embrace this year. I have so many spring dresses that I love and am excited to wear, so it’s not like I need anything, but it’s also nice to freshen up things with a floaty new frock. After all, spring shopping is the best shopping! Gap mid-rise true skinny ankle jeans – I already own these jeans, but my current pair is getting baggy after I lost 10 pounds since Thanksgiving. The recent Friends & Family promotion made snagging a smaller pair a no-brainer. I’m going to bring these on the trip along with the larger pair for when I inevitably eat too many orders of fish and chips. Banana Republic machine-washable merino shell in medium blue vintage – When I was scouring the Gap family of brands during their Friends & Family promotion for the aforementioned jeans, I came across this merino shell. It’s not exactly the most exciting purchase, but it’s a versatile piece to wear to work with an a-line mini skirt or jeans on casual days. I’ve already worn it three times and it retains its shape throughout the day. Lululemon “Effortless Jacket” in navy – Dave had heard good things about Lululemon’s men’s pants for travel, but they didn’t stack up. (They made his rear end look baggy.) While he was shopping, I came across this cropped jacket and fell in love. It’s such an impulsive purchase for me, but I think it’s going to be great for bike riding on chilly days. It runs incredibly large. I first started with an 8 and 10 in the fitting room, then tried the 6, and then the 4. I liked how the 4 fit most in the body, but the sleeves were too short and so I opted for the 6 instead. The jacket has so many pockets and storage options, plus there’s a stowaway hood in the collar for unexpected showers. The cropped length also looks adorable with casual dresses. Paravel crossbody capsule in scout – I received a 20% discount code and figured it was a good time to buy the Paravel bag I’ve crushed on since last summer. It’s every bit as perfect in person! 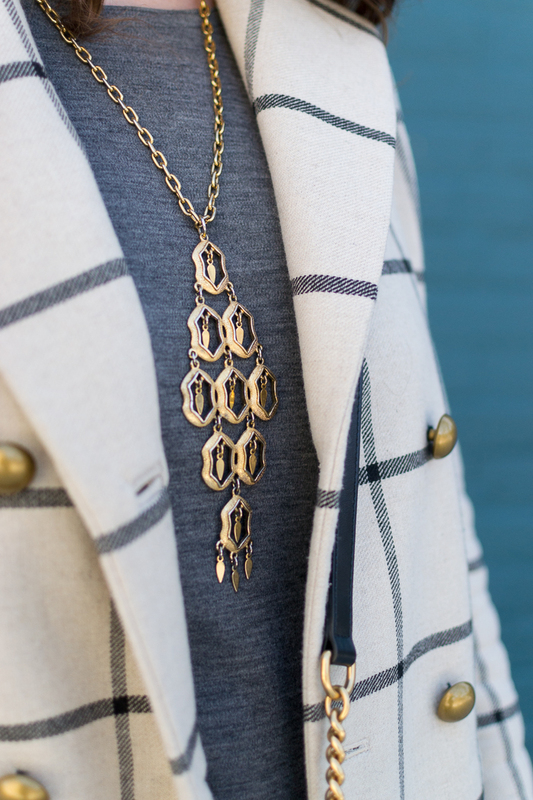 vintage necklace (pictured above) – I couldn’t pass up this $10 beauty when we visited a local vintage shop earlier in the month. Sam Edelman “Lior” loafer in black – The toe box was way too long for me and they felt cheap in person. Banana Republic “Sloan” skinny-fit pant in black – I loved these pants a few years ago when I was a size smaller than I am now. I can technically zip up the other pair, but they’re so tight that they look like yoga pants! I decided to order the size larger to bring on our trip and wear to work this season. Unfortunately, though, Banana Republic must have changed the fit because I can’t even come close to zipping the larger pair. Leith racerback shift dress in light pink – I love this dress so much in black (worn here), but the light pink was a let down. It was a bit on the sheer side and looked inexpensive. 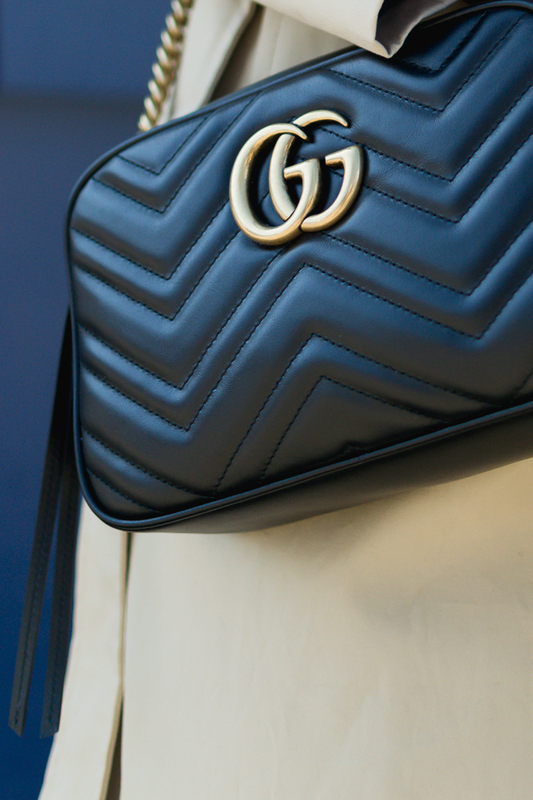 Gucci ‘Marmont’ small matelassé shoulder bag – This. Is. Everything. I actually wondered if I’d still be enamored with it after saving up for nearly a year. Spoiler: I do. It’s a great size for all of my daily essentials and really does elevate any look. See my post on what fits inside here. J.Crew new icon trench coat (worn here) – My other trench coat (seen here, but most is covered with a scarf) is more on the casual side with a shorter hemline and a wide lapel with buttons that start lower. I still like it, but I wanted something that was more traditional. J.Crew’s latest version of their trench coat has a higher waist and a slightly shorter length. (Although, it still hits right above my knee and I’m 5’7″.) I went with my typical size 8 in jackets there, so I’d say it fits true to size. Although, I do have narrow shoulders and a small chest, so keep that in mind. J.Crew classic striped t-shirt – I live in striped t-shirts on the weekends and my old ones were getting a little dingy after years of going through the wash. This runs a little boxy, which I’m going to appreciate after eating and drinking on our trip! Puma ‘Basket’ sneakers – I wore my black suede Puma sneakers just about every day on our trip to Copenhagen (check out my travel guide here and tips here). I wanted a pair of white leather Pumas ever since that trip and finally spotted this style. They’re not readily available anymore, but sizes do pop back on Amazon. I prefer this style over my Stan Smiths because they have a slimmer design that looks sleeker. Target gingham bag – Isn’t this darling? I prefer it with the strap tucked inside and carried by the top handle. I’m not sure how much I’ll actually use it this spring, but it was too cute to pass up. That said, I already put together a few outfits featuring it in preparation for when the weather finally gets warm. I love it with the black dress below and a pair of black slides. Leith racerback shift dress in black – I’m all about a versatile, inexpensive black dress — especially when it’s machine washable! It runs true to size, but I’d recommend going a size up if you have full hips. I liked having the extra room. J.Crew reversible V-back long-sleeve tunic – I ordered this in a small and it was too large and looked sloppy. The deep V looked best worn in the front, but I couldn’t shake the feeling that it looked like a nursing shirt! It’s really soft, though. Line & Dot ‘Adelene’ babydoll dress – There are few things that are more “me” than a short, loose dress. However, the lining on this one was skintight and I could barely push it down over my hips. I hate when brands do that. I get that it reduces manufacturing costs, but a girl who wants a billowy dress doesn’t want a restricting lining inside! What about you? What’s the latest and greatest in your wardrobe? What’s on your must-have list?